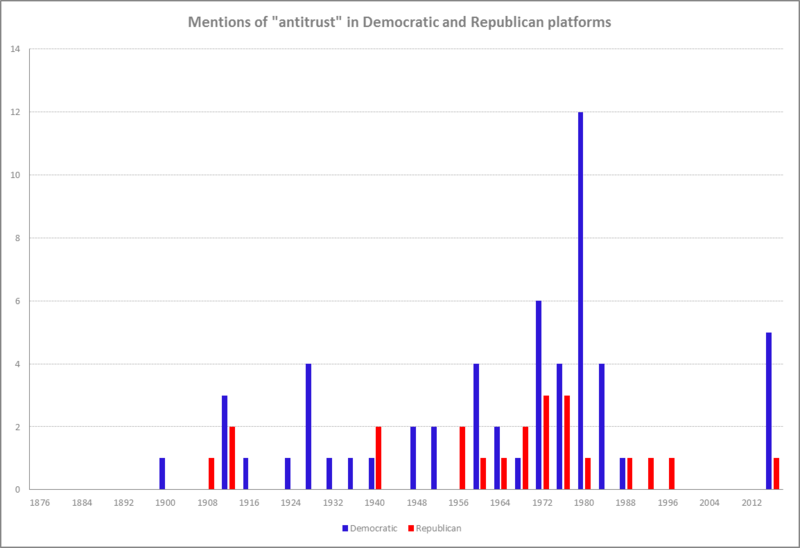 In the fourth and final installment of our four-part series on the history of antitrust language in American political discourse, we review the evolution of economic language related to trusts and antitrust in all Democratic and Republican platforms from the end of WWII until today. Read previous installments: first, second, and third. This is the opening paragraph of an October 26 article in The Economist–not only one of the most read and influential newspapers worldwide, but also a staunch pro-business advocate. The article, which opposes the AT&T-Time Warner deal, goes on to say that “boosting competition should be a priority for whoever occupies the White House in 2017, and for Congress. Now a test case is waiting in the in-tray. AT&T, America’s fifth-biggest firm by profits, wants to buy Time Warner, the second-biggest media firm. The $109bn megadeal isn’t a simple antitrust case, because it involves a firm buying a supplier, not a competitor. But there is a strong case that it will limit consumer choice in a part of the economy that is rife with rent-seeking and extend a worrying concentration of corporate power. It should be stopped.”1)“Vertical limit.” Economist, October 2016. This is not only one of the latest examples of a possible change of heart at The Economist, but also a sign that the basic paradigms of competition, regulation and antitrust are changing in other places as well. High politics is one of them: both Donald Trump and Hillary Clinton opposed the deal before the election, making it a bi-partisan view. 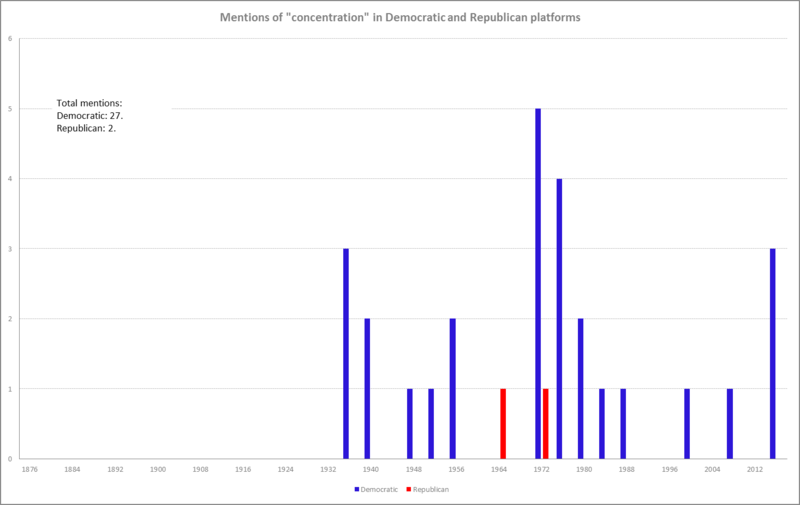 In the last installment of this series, we analyzed the language in Republican and Democratic platforms regarding these issues in the period leading up to the end of WWII. In this last part, we will focus on the years since WWII. 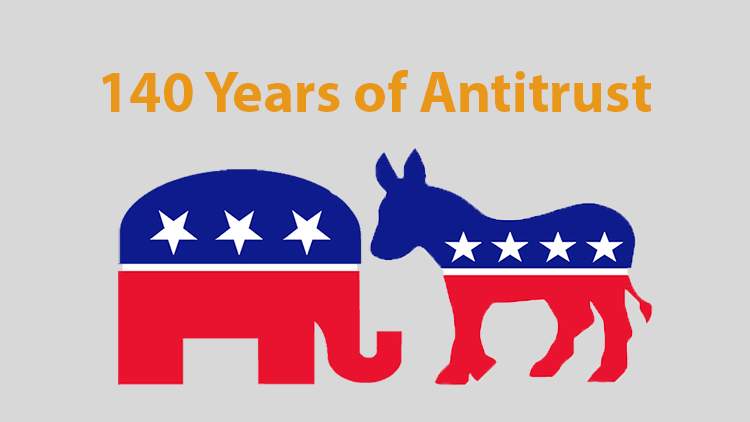 FDR’s presidency marked the end of a decades-long emphasis by the federal government on antitrust and regulation, starting with the Sherman Antitrust Act of 1890. WWII commanded much of FDR’s attention. The following years were, in large part, focused on rebuilding the US domestic economy as well as its new status as leader of the free world. Until the 1970s, U.S. antitrust policy and enforcement were still largely based on the legislation and case law that accumulated from as far back as the Sherman Antitrust Act. Notwithstanding, in 1950, during Harry S. Truman’s presidency, Congress passed another major antitrust law, the 1950 Celler-Kefauver Act. The act closed a loophole in existing legislation that enabled businesses to merge by buying the assets of their competitors rather than buying their stock. 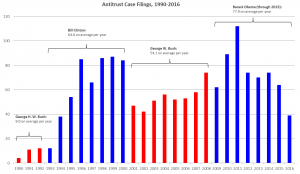 However, owing to major advancements in economic theory, the proliferation of mergers that led to a growing body of evidence, and the first steps of computerization, the thinking behind antitrust was headed for a major overhaul. 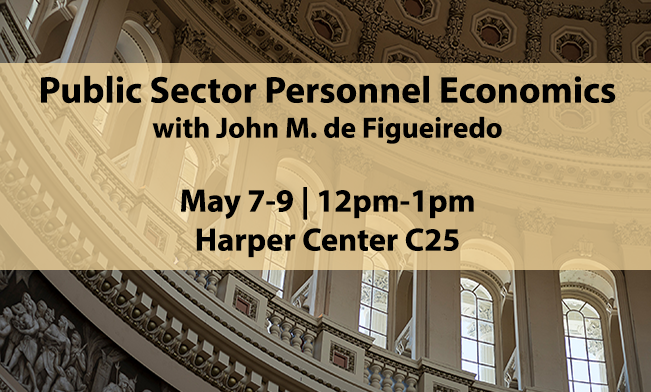 During these years, a new school of thought that was more focused on microeconomic theory, market power, market structure, cost savings, and other issues that differ from industrial organization theory, started to develop. This school of thought was later nicknamed the “Chicago School” because many of its developers were members of the economics department of the University of Chicago. The Chicago School proved to be a hotbed for Nobel laureates, such as Milton Friedman, Gary Becker, Eugene Fama, and George Stigler. Of these scholars, Stigler’s contribution to antitrust and regulation was the most influential. Central to the Chicago School is the assumption of rational behavior of all market participants. Their choices are rational, their behavior can be explained using rational reasoning, and their expectations are rational. Stigler’s theory of Regulatory Capture asserts that, instead of serving the public’s interest, regulatory agencies in fact promote the interests of their respective regulated industries. The regulated industries achieve this by exerting political pressure that proves stronger than the dispersed political power of the public’s interest. Another Chicago School scholar who had a significant influence on antitrust policy is Richard Posner. Posner argued that the 1960s antitrust laws actually pushed prices higher for consumers. Similar views were developed by Robert Bork, whose alma mater was the University of Chicago. In his 1978 book The Antitrust Paradox: A Policy at War with Itself (Basic Books, 1978), Bork argued that antitrust should focus on consumer welfare rather than competitors and that mergers often yielded beneficial results to consumers. The Chicago School’s influence extended well into the 2000s, leading to a major wave of mergers and acquisitions. 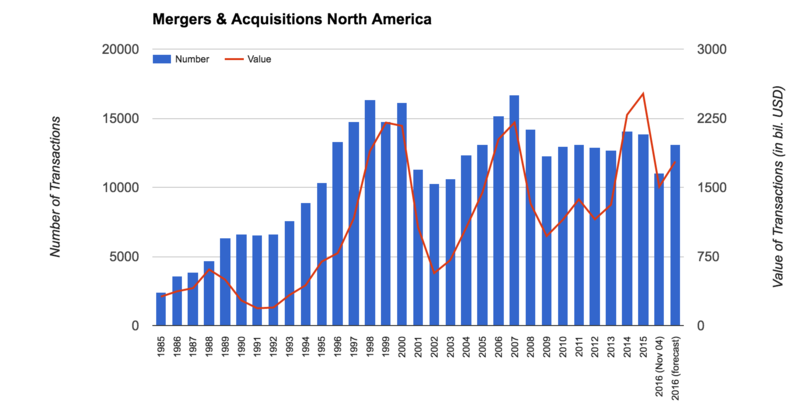 According to data gathered by the Institute for Mergers, Acquisitions and Alliances (IMAA), between 1985 and 1998, the number of mergers and acquisitions in North America grew almost 7-fold: from 2,385 to 16,330. The average for the years 1999-2015 is 13,330. The dollar value of the transactions fluctuates, but this is mainly attributable to booms and busts in overall stock prices. The high levels of M&A activity coincided with a sharp rise in lobbying expenditure. According to the Center for Responsive Politics’ OpenSecrets.org, which provides data from 1998, total lobbying spending grew from $1.45 billion in 1998 to $3.22 billion in 2015. Nevertheless, as Republican platforms continued to push for deregulation, Democratic platforms abandoned the subject completely after 1992. 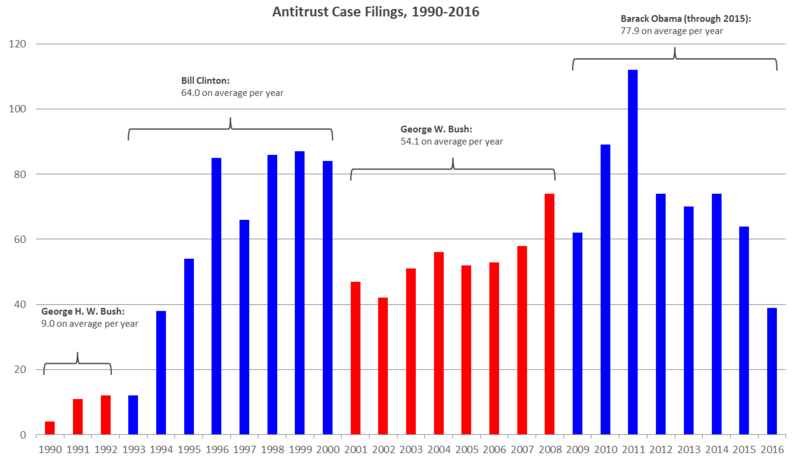 The degree to which it became a partisan issue can be anecdotally demonstrated by analyzing the number of antitrust cases filed by the Department of Justice, based on the DOJ’s data on such filings from 1990 to 2016.3)See the DOJ’s antitrust case filing data here. 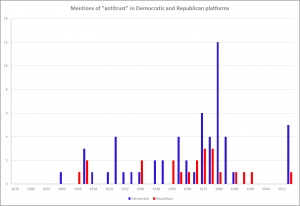 Calculating the case file by each president reveals that filings made under Republican presidents were significantly smaller compared with Democratic presidents. 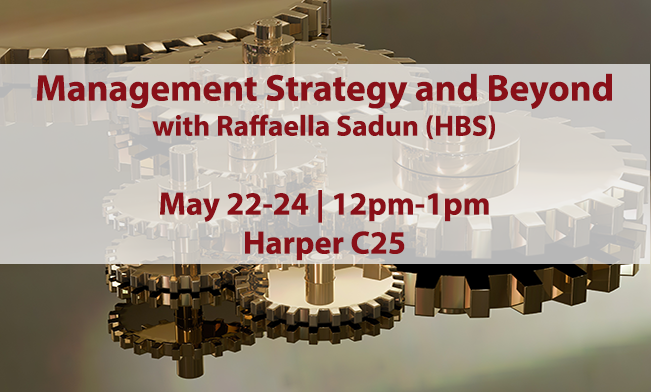 Although the Chicago School of thought is still powerful, a competing paradigm has been gaining recognition and traction, the main stream of which is behavioral economics. The scholars most identified with this school of thought are Daniel Kahneman, Vernon Smith, and Amos Tversky. In 2002, Kahneman and Smith won the Nobel Prize for their work. Behavioral economists challenge the basic premise that humans act rationally. For example, one theory states that consumers discount the future more heavily than existing economic theory would predict and that, rather than making calculations, consumers are affected by their own past experiences and choices. This means that previous, more traditional, predictions related to consumer behavior–such as reacting to price changes–may be wrong and that the whole thinking behind markets, competitiveness, prices, efficiency–and therefore regulation, deregulation and antitrust–may be wrong as well. Kahneman and Tversky started working on their theories over 35 years ago, but things may finally be starting to change. On September 20th, in her first major address after becoming Acting Assistant Attorney General at the Antitrust Division, Renata Hesse laid her philosophy in front of the 2016 Global Antitrust Enforcement Symposium: “Antitrust,” Hesse said, “is making headlines again, and I don’t just mean in antitrust publications. It is, as it was at its inception, the stuff of popular imagination.4)“And Never the Twain Shall Meet?” Acting Assistant Attorney General Renata Hesse of the Antitrust Division’s opening remarks at 2016 Global Antitrust Enforcement Symposium, September 2016. Hesse and others have been pointing to what seems like a pendular movement in antitrust, away from leniency and perhaps even negligence, toward new thinking and new policies for reinvigorating competitiveness and decreasing the concentration of economic power. The impending US election sits at the end of a very long process of changes: academic, societal, business-related, and more recently, political. “Large corporations have concentrated their control over markets to a greater degree than Americans have seen in decades—further evidence that the deck is stacked for those at the top. Democrats will take steps to stop corporate concentration in any industry where it is unfairly limiting competition. We will make competition policy and antitrust stronger and more responsive to our economy today, enhance the antitrust enforcement arms of the Department of Justice (DOJ) and the Federal Trade Commission (FTC), and encourage other agencies to police anti-competitive practices in their areas of jurisdiction. 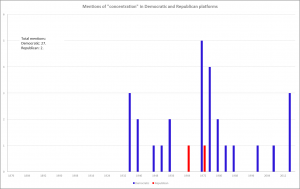 Indeed, the 2016 Republican platform seems still largely conservative, but more and more Republican politicians–and certainly Democratic leaders and thinkers–are leaning toward a recognition that competitiveness is faltering, that some businesses may be too powerful, that prices may be too high and that innovation is not as transformative as it should be. 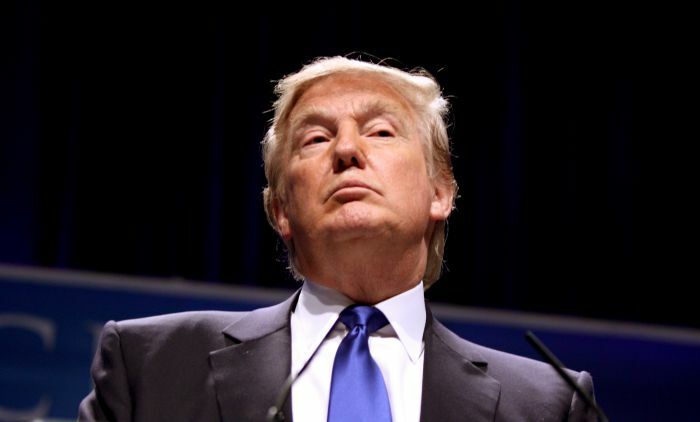 Following Trump’s victory, it also remains to be seen how committed he will be to the party’s platform considering his anti-establishment spirit and his objection to the AT&T-Time Warner deal. 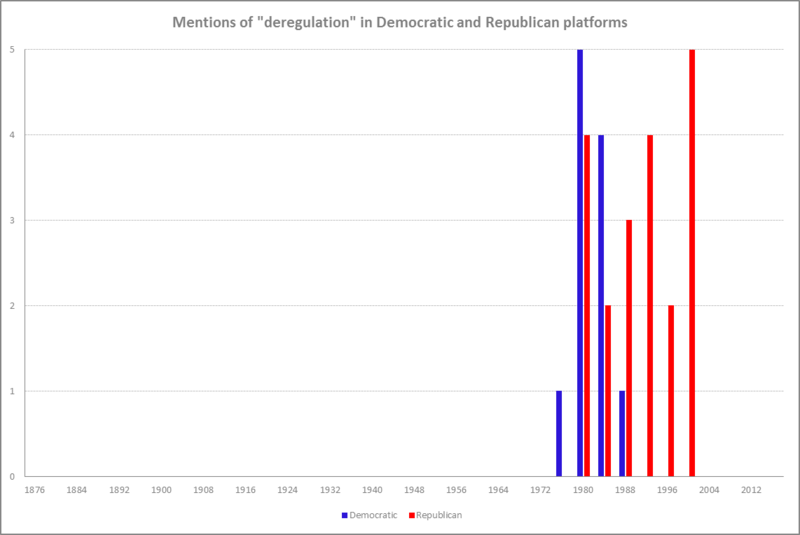 At any rate, there are more and more instances where Republicans promote regulation, either alone, or, more often, with Democratic lawmakers (see the discussion on the first installment of this series). The Sherman Act of 1890 and the laws that followed it gave the US and the developed world a tool for dealing with the huge businesses that were the result of the Industrial Revolution. Since then, not only did technologies and business practices change, but also new paradigms, based on experience, data, and learning, evolved. The “spring” of U.S. antitrust, the period in which Thurman Arnold oversaw the Antitrust Division, ended 73 years ago. Now may be the time for spring again. The most powerful agent of change, the political system, seems to be ready. The discourse is changing, the right and the left are converging, and more empirical data is accumulating. 1. ↑ “Vertical limit.” Economist, October 2016. 3. ↑ See the DOJ’s antitrust case filing data here. 4. ↑ “And Never the Twain Shall Meet?” Acting Assistant Attorney General Renata Hesse of the Antitrust Division’s opening remarks at 2016 Global Antitrust Enforcement Symposium, September 2016.